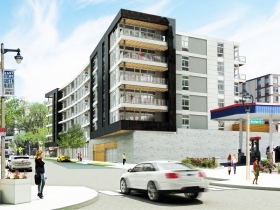 The Prospect Apartments rendering. Rendering by Rinka Chung Architecture. An 80-unit, 6-story apartment building with over 9,000 square feet of retail space planned for a surface parking lot at 2214 N. Prospect Ave. sailed to unanimous approval by members of the East Side Architectural Review Board Friday, September 18th at a public meeting held at the East Branch of the Milwaukee Public Library, 2320 N. Cramer St. 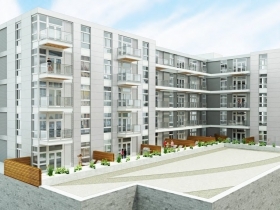 The building, designed by Rinka Chung Architecture for Robert Joseph and his firm Joseph Property Development, is to be located directly across the street from the 52-unit Overlook on Prospect apartments which Joseph redeveloped from the old Prospect Mall. The site to be developed retains the parking sign for the “Marcus Theaters” once located in the former mall. Parking spots are advertised at $50 per month; the remainder of the site consists of a Qdoba Restaurant built in 2003. The overall effect is bleak and not contributory to the neighborhood. The property is currently owned by Prospect II LLC, which purchased it in 2004 for $400,000. The site is currently assessed at $925,300. The 2,520 square foot Qdoba, which accounts for $258,600 of the assessment, is rented for about $20 per square foot a year, according to Assessor records. The property currently is taxed at $32,506. When developed it would most likely generate nearly ten times that sum. Ald. Nik Kovac, the ARB chairman said the city tweaked its zoning code specifically to attract such development as this when it lowered the maximum height and raised the minimum height of buildings. Architect Matt Rinka noted “the fact that there is open parking makes people feel they can speed on Prospect. The hard edge of the building will slow people down. We discuss this in Urban Design Strategies class.” The “hard edge” is a rather blank south-facing wall that sits on the property line the parcel shares with a gas station to the south. Rinka explained that city code regulates penetrations on property lines, hence no windows here. The south end of the parcel is some seven feet below grade, Rinka said, affording a first level of parking on N. Prospect Ave. and an upper level of parking to be accessed from E. Ivanhoe Pl. There will be 136 slots, Joseph said. “We added more parking than code,” he said, which has not been the trend lately. Why? 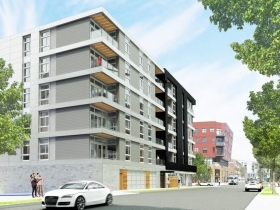 “My father owns the building to the east [across the alley] and some of his overflow parking is on the lot.” Those tenants would be able to rent parking spots in the new apartment building, he said. There will also be internal bicycle parking, Joseph added. 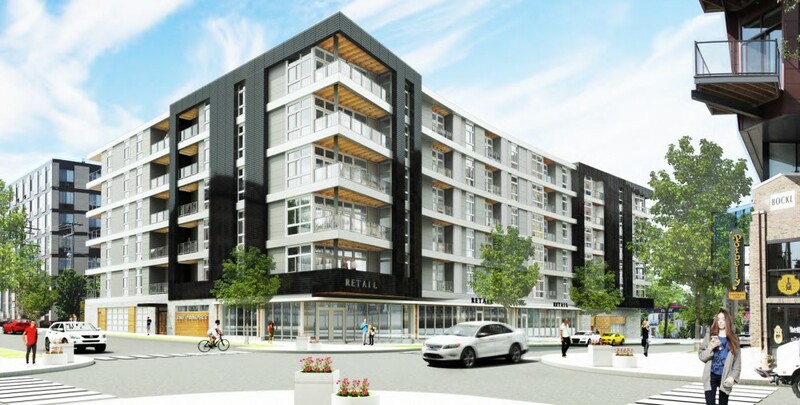 Due to the site constraints and the two levels of parking, the residential portion of the building will not get down to business until about 18 feet above street grade. 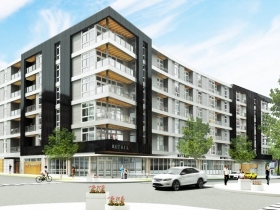 The building will wrap around the northwest corner of the block, with a slightly parabolic “boomerang” effect (as Rinka put it) allowing balconies to “pop out” over the sidewalk. “It will be very dynamic, almost creates a sense of movement,” Rinka said of the feature. The southeast, or alley/gas station elevation will be devoted to a “rock garden” plaza, as Joseph put it. The lobby will enter onto a community room with a glass garage door wall that can be opened to the plaza. Rinka was also prepared to discuss the “Materiography of the building.” He brought samples of a white aggregate product that will form the white bands that will wrap around the building, creating its horizontal dynamism. The vertical elements will have a black, glossy, reflective finish to them. In fact, they will be constructed of terracotta, “an expensive, historic and modern material,” as Rinka put it, showing recent examples of its use elsewhere. It has not been incorporated in Milwaukee residential construction in some time, he said. Terracotta is seen as an element in numerous older residential buildings along N. Prospect Ave. and elsewhere on the East Side. Black terra cotta is seen in the Viking Apartments by Tullgren, on N. Farwell Ave. “Terra Cotta’s going to last 100 years,” Rinka said confidently. Terracotta is not usually coupled with wood, or faux wood-grain surfaces, but this is the 21st century, and a miracle product called “Longboard” will serve as the woodlike soffit material for all of the balconies that project over the sidewalk. The Canadian product is a “metal that looks like wood,” Rinka said. It is channel-formed, lightweight, possibly impervious to minor dents and scratches (it will be up on a ceiling after all) and easy to install. It won’t warp or otherwise need maintenance, as would wood. Fowler complimented the architect and developer for the completeness and detail of the rendering and the presentation before moving approval. The motion was seconded and passed unanimously by members Kovac, Fowler, Piwoni, Lynn Sbonik, and Mary Wilkinson-Church, with members Lora Keller and Matt Jarosz excused. The overall architecture is what we’ve come to expect from Matt. Great job. With that being said, I can’t believe there wasn’t more discussion on the southwest corner of the building by the committee. I don’t understand the need for two entrances to the parking. The Prospect entrance kills the southwest corner of the building. Why not be creative and activate that corner to match the activation in front of Colectivo and reach out to Urban Outfitters? I understand the grade change , but why not take advantage and create a special space? The current parking solution has two entrances to two levels of parking that aren’t connected. A cheaper solution than to connect with ramp and allows for more cars. Evidently, some of which are for an adjacent building. Not the public. Why not go underground with a level of parking and stretch the retail space all the way south to the corner of the building? We have plenty of residential buildings where the retail space is an afterthought We don’t need another. Bruce, the two parking entrances allow them to use the grade change and have two levels without ramping. Only one entrance would require a ramp and lose quite a few spots. Nik. My point exactly. The grade change does allow for two levels of parking without ramping. A solution that is cheaper and allows for more stalls. My suggestion is to explore a different solution that connects the ramps. Could include 3 levels of parking with one underground, allowing the developer to stretch the retail to the southwest corner of the building. More expensive I realize, but how much? Activating the entire elevation along Prosoect and the revenue that would come along with it may well offset the expense and would certainly benefit the pedestrian experience for the public. Building underground parking costs upward of $50,000 per space. And each level below that (sub-basements) costs 2-3 times what the level above that cost. No doubt that going underground could be cost prohibitive. The issue here is how to achieve the balance of stretching the retail across the Prospect frontage while at the same time having the project make sense for the developer. Fact of the matter is you get one chance to solve the equation. Maybe it’s a third level of parking utilizing the entire building footprint with the resi stacked above. I’m not privy to the pro forma , but am curious what the delta to the return would be if such an analysis was performed. 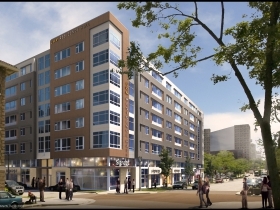 Another great development for the North Avenue Eastside neighborhood. I have a question concerning the area as a whole maybe someone here could answer, or at the very least, have a lead upon. Two pieces of property in particular; the parking lot along Farwell Avenue from Windsor Place onto Oak Leaf Trail and the open grassy area along Oakland Avenue also between Windsor Place extending to Oak Leaf Trail, any word on potential development on those two locations? They seem like prime pieces of property within the neighborhood, I find it hard to believe something is not in the works, if not just made public. A lot of us on the east side would strongly not favor a two way conversion of Prospect and Farwell. I understand the slowing of traffic, but it seems having two parallel thoroughfares is counterproductive. Which one would get bus route and streetcar preference? Or even bike route preference for that matter? Wouldn’t that have a greater negative impact on businesses on one of the streets? My thoughts exactly, Bill. From my observations when a major one-way street is made into a two-way street it makes a mess, increases congestion, and makes getting around the area more of a hassle. The conversion of Wells into two-way comes to mind where one must be weaving lanes to get out of the left-turn only, right-turn only lanes that suddenly pop up, go around the long line of cars waiting to make a turn, etc. 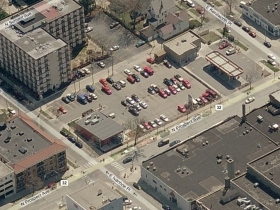 Also, unless you completely eliminate parking on Prospect/Farwell, wouldn’t turning these into two-way streets allow for only a single lane in each direction, much like Brady street is set up? That street is a madhouse to try to drive, unless it’s early in the morning or the middle of the day during a week day and why I avoid taking it at all costs. I’m no speed-demon driver, I just like to be able to cruise along at the posted speed limit without having to do stop-go-stop-go oh this guy’s turning, now I have to sit here for 3 lights…. And yes, I do live in the neighborhood, right on Summit Avenue, so I’m not just spouting off about this. Before Wells was converted to two-ways I regularly watched cars drive the wrong way, get into accidents by turning from the center lane, and use Wells as a freeway. Yes, sometimes those driving cars have to wait a minute but as a resident of this neighborhood I’m thrilled that Wells was converted. State as well, now some cars still go a bit too fast on State (not as bad as they used to) but that’s because of the silly setup of the parking lanes, which hopefully one day will be corrected. Now I agree the Farwell / Prospect pair might be a bit bigger of a change but I believe in the long run it will be a big benefit, especially on Farwell. Surprised that Crystsl has no comment on the 20 ft brick wall she’ll have to look at when sipping coffee at Colectivo. As far as Brady St and its pace of traffic it’s exactly what it should be. Congestion is a GOOD thing when it comes to a street like Brady which is full of storefronts. Brady is light years ahead of what it once was when you could drive the “posted” speed limit any time of the day. One only needs to look at what’s happening on East North Ave in Wauwatosa to see the vitality of a congested two way street. Dave – Yes, I also remember cars going the wrong way on Wells. It just seems like the street wasn’t configured well when it was made a two-way and that’s what I fear would happen with a conversion of Prospect/Farwell, especially once you throw in a streetcar route. This would have to be very, very thought out. One-way streets can indeed make it more difficult to reach businesses, but with Prospect and Farwell running parallel and well-linked with cross-streets this has never felt like a real issue here. As for speeding and improper turns…well I think people are always going to drive like morons. Taking a trip down North is an adventure every day. Bruce – Not all streets need to be teeming with congestion if they have storefronts. Yes, the liveliness of Brady is nice if you’re just walking around, but I wouldn’t say Brady is necessary to get around the East Side like Prospect and Farwell are. We don’t need Prospect and Farwell to be just like Brady Street. Also, the longer people have to sit in traffic that’s less time they have to go and visit said storefronts later. Unfortunately not everyone who lives in the city can take part in creating a biking/public transit utopia…some of us have to commute out of the city for jobs in our field. As for that 20 foot brick wall…it’s no worse of a view than the current Qdoba and parking lot. I think that opinions on this mainly come down to one’s primary use of these streets. For those who mostly use these as walkers, bicyclists, or bus riders, two-way seems better. (This group likely also includes owners of storefront businesses, as I believe there is a pretty strong consensus that such businesses do better on two-way streets.) For those who are primarily drivers on these streets (especially as the start/end of a suburban commute, as opposed to say regularly driving from Downtown to Whole Foods and back), one-way seems preferable. I’m in the first group, so my opinion is surely biased, but it seems pretty uncontroversial to say that dense urban areas should favor walkers/bicyclists/bus-riders over cars when making these design calls. I don’t rule out the possibility of some solution that keeps the one-way pattern, but it’s clear that at present the car/truck traffic moves unacceptably fast on these streets. (If Crystal really drives at the posted speed limit, she’s part of a tiny minority.) So I wonder, what speed-control mechanisms would proponents of the one-way pattern suggest for these streets? I know that one-way streets are supposed to be bad, but I’ve never understood that viewpoint. Until last year, I had an apartment in Manhattan (where at least 90% of the streets are one-way), and when walking, I always found one-way streets easier to cross (because you only worry about traffic in one direction); this was true even on Manhattan’s north-south avenues (which can have up to 6 traffic lanes—but all going the same way). The way to stop people from speeding on one-way streets is by synchronizing traffic signals so that there is no reason to speed. Look at Madison’s Johnson Street as an example of what can be done. Johnson’s posted speed limit is 25 mph, and, for years, the lights were timed for exactly 25 mph (and nobody sped). Lately, Johnson’s signals seem to be timed for 30 mph (although the posted speed limit is still 25) and everybody does 30; nobody goes any faster. Even at intersections without signals, Johnson (and its westbound counterpart—Gorham/University) is safe and easy for pedestrians to cross. In Manhattan, all the one-way avenues have traffic lights timed for 30 mph—the posted limit—and it works out well. At off-hours when Manhattan traffic flows smoothly, it is quite possible to drive through more than 100 consecutive signaled intersections (more than 5 miles) at 30 mph before you hit a red light; you just see light-after-light turning green as you approach. Dave Reid, how many wrong-way vehicles are on Prospect and Farwell these days? 1. There is a lot of wrong way traffic on Farwell and Prospect. As a Prospect resident, I see it at least once a week. This week’s incident came while on the bus heading south on Farwell, someone pulled out of the FedEx lot and went north. Lots of honking ensued. 2. I don’t think the one-way argument is as much about speed, because as you note there is a clear remedy for that. I think it’s a structural issue. As long as its one-way traffic, your viewing angle on many businesses is reduced (setbacks, angling, wrong corner of building). Likewise, it’s more difficult to get to those places, because it can involve circling for drivers and cyclists (this is probably more pronounced on Farwell/Prospect where the streets are angled against the grid, located at the edge of the grid and intersect with a number of one-ways). The end result is that a lot of retail space on Farwell is forgotten about. I suspect cities with higher population densities (like NYC) are able to overcome this because pedestrians go two-ways. I have no doubt that in Milwaukee one externality of the one-way Farwell/Prospect pair is reduced commercial viability of many buildings not intersecting the prominent East/West streets.